Ghetto Dawg 2 is surprisingly just as good as the first one. I can't believe it. 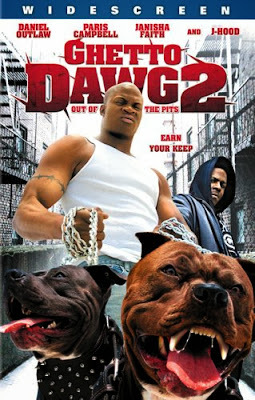 This time, Dante (Outlaw) has to fight for his life when his pitbulls lose in an illegal fight. A hitman with a cold heart of gold, if that makes any sense, named Jojo (Campbell) helps him, and it turns ugly for all involved. Paris Campbell as Jojo is great, and reason alone to see this. Outlaw also puts in a decent performance. The writing and directing are top-notch for a DTV effort. Lionsgate has been known to put out urban garbage (State Property 1 and 2, Gang Tapes) so this was a surprise. The dogfights are brutal and so are the killings by Jojo, and it was cool to see this intact and not cut up like a rap music video. Don't roll your eyes at this one. It's actually worth seeing.